Pigeon Forge is an incredible place to celebrate Christmas and seeing special Christmas shows the perfect way to bring the magic of the holidays to life! From the gorgeous lights of Winterfest to the snow-capped peaks of the Great Smoky Mountains National Park, Pigeon Forge truly is a winter wonderland. Every winter season, terrific local dinner shows and theaters put on spectacular Christmas performances. From awe-inspiring nativity scenes to heartfelt holiday tunes, the yuletide season brings some excellent entertainment to the Smoky Mountains. 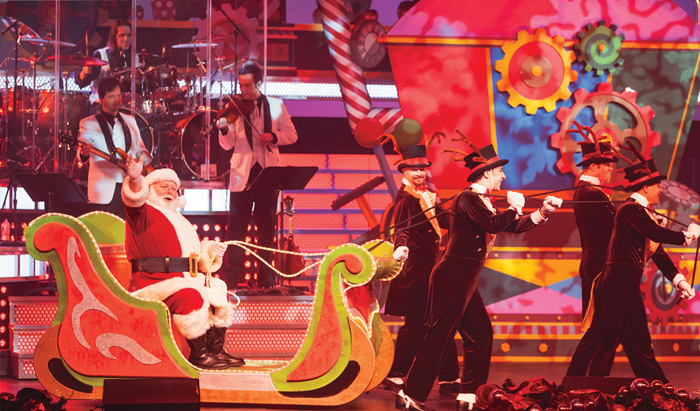 To help you find the best Christmas Shows in Pigeon Forge, we've made this handy list. Start a new holiday tradition with your family by seeing these fun, inspiring, and magical performances in the Smokies! To help you find the right shows for your trip, we've also included ticket prices, show schedules, and a map of where to find these excellent dinner shows and theaters. See skilled horsemen perform daring feats, watch toys come to life to the music of the Nutcracker Suite, and watch a moving nativity scene complete with live animals at Dolly Parton's Dixie Stampede Dinner Theater in Pigeon Forge! This spectacular Christmas show features excellent performers, beautiful music and stunning special effects. As one of the first dinner theaters in Pigeon Forge, Dolly Parton's Stampede has delighted families for decades and its annual Christmas performance doesn't disappoint. During the show, you'll dine on a delicious meal of rotisserie chicken and hearty country sides. This excellent theater boasts the largest Christmas show in the Smokies. At this timeless performance, audiences will hear a variety of classic Christmas songs and well as newer music performed live on a lavish set. Special effects, laser lights, ice skaters, acrobats, and dancers create a marvelous show that weaves the wonder of Christmas into every act. A juggling comedian offers some great laughs and the Smoky Mountain Opry brings together a dazzling nativity scene complete with camels, horses, donkeys, and a white lion. Needless to say, Smoky Mountain Opry pulls out all the stops for their Christmas show. Country Tonite theater brings some of the biggest names in country music to Pigeon Forge, but for Christmas they bring out their own award-winning cast of singers and dancers to celebrate the holidays. A great mix of classic Christmas songs and fun novelty songs with characters like Rudolph the Redneck Ranger. You'll love these delightful renditions of classic Christmas tunes, bright holiday sets, and an exceptionally talented cast. From inspirational gospel music to beloved Christmas tales, this theater in Pigeon Forge is an excellent place to share the wonder of the holidays with your family. Come see a heartwarming Christmas Story about two feuding families in the Smoky Mountains. The "Christmas Dinner Disaster" show is a popular comedy show complete with holiday music, incredible stunts, and lots of laughs for the whole family. In this show, the two fueding families try to set aside their differences for one night with mixed results. While you enjoy this hilarious show, you'll dine on a country-style feast complete with fried chick, barbecued pork, and more old-fashioned classics. Every season, Sweet Fanny Adams theater dreams up a unique variety show filled with song, dance, and comedy routines, including a special Christmas show! Bah Humbug is this year's Christmas show and it's one you won't want to miss. This unique theater in nearby Gatlinburg, TN resurrects an old vaudeville-style show with plenty of slapstick and hilarious fun. This year's Christmas show, "Mistletoe & Malarkey," will feature the shortest version of Charles Dickens' A Christmas Carol, a sing-a-long, and the "Dancing Trench Coats." As the longest-running theater show in the Smoky Mountains, Sweet Fanny Adams continues to deliver side-splitting laughter year after year. No matter what you do for your Smoky Mountain Christmas vacation, there are plenty of wonderful ways to make cherished Christmas memories with your family. All the same, these special Christmas shows are sure to make the most wonderful time of year even more festive and fun! Be sure to check at least one of these performances during a stay in one of Cabins USA's family cabin rentals!